The Golden Age of Dutch painting has been a constant source of inspiration for contemporary culture – from the book turned movie, The Girl with the Pearl Earring, to our favorite pastime, flower arranging. Artists like Huysum, Bosschaert, and Vosmaer hold their place in history as the creators of mesmerizing paintings depicting sprawling, wild, and heavy arrangements rich with allegory and a distinct look. And as you can see, Dutch still life paintings depict more than the tulips that Holland is famous for, resulting in a show of artfully arranged blooms from all over the world. Vase of Flowers, 1722, Jan van Huysum. Digital image courtesy of the Getty’s Open Content Program. When looking at these works of art, we are able learn a lot about how flowers were used and valued throughout history. Flowers made for an enchanting subject in the 16th century when flower bulbs were incredibly rare and expensive. The fashion was to create still life paintings that were heavy with allegory, colors, and loose, wild arrangements. A trademark of these paintings are the deep, dark backgrounds that emphasized the light and colors of the flowers in the center of the painting. 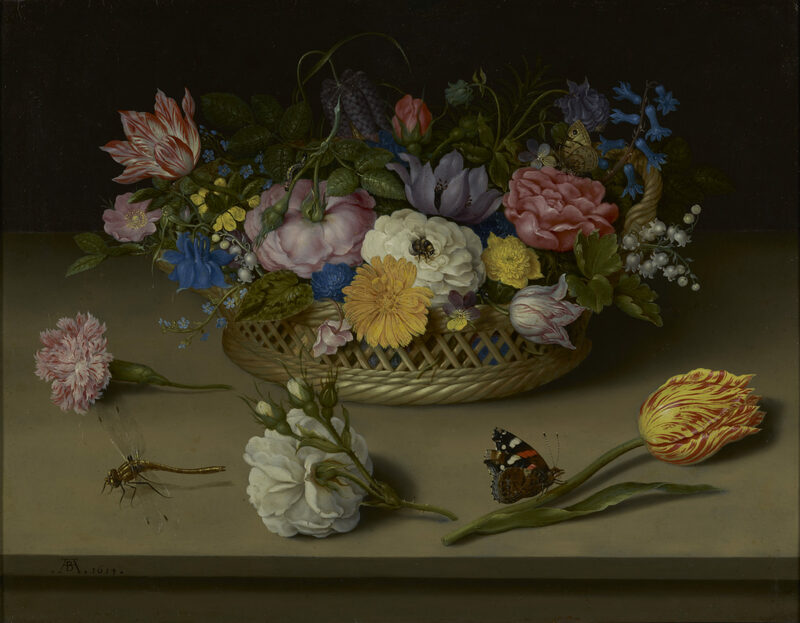 Dutch still life paintings highlighted exotic flowers, fruit, and other natural items and the strong international trade relations of the time while also showcasing an artists’ skill in handling light, nature, and depth. Flower Still Life, 1614, Ambrosius Bosschaert the Elder. Digital image courtesy of the Getty’s Open Content Program. As previously mentioned, flowers during this era were highly prized and extremely valuable, often costing exorbitant amounts of money as they were difficult to locate and transport. Rather than trying to procure fresh blooms, many turned to commissioning paintings featuring flowers they loved or desired. Artists and collectors could create any arrangement they dreamed up, producing dramatic and fantastical combinations in paintings that live on today. Fast forward several centuries later, and many of these iconic paintings are now hung on the walls of galleries and museums all over the world where florists, brides, and flower lovers can draw inspiration for their next bouquet or event. Dutch flower still life paintings have helped inspire and pave a new direction in floral design as new interests in sustainability and an overgrown, natural look is becoming more and more revered. 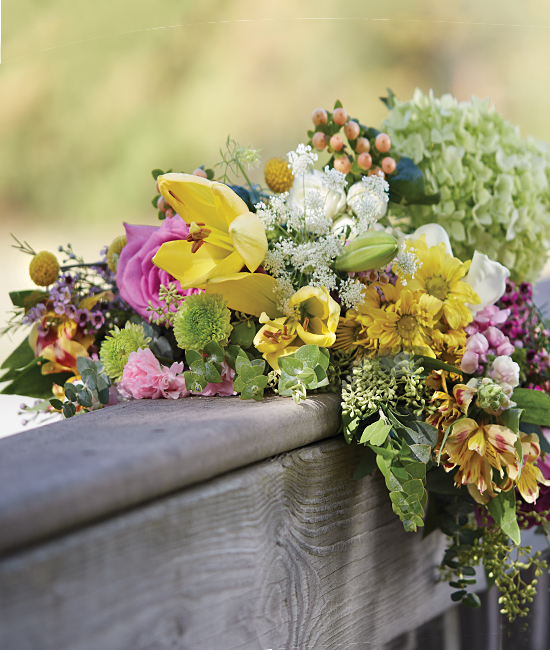 From dramatic Dutch-style floral centerpieces to the wedding trend of utilizing farm fresh flowers for organically arranged bouquets, it is no wonder there is a revival of Dutch Masters flowers! Only this time around, instead of paintings, we are taking inspiration from art history and creating beautiful bouquets that are wildly creative and natural in real life. 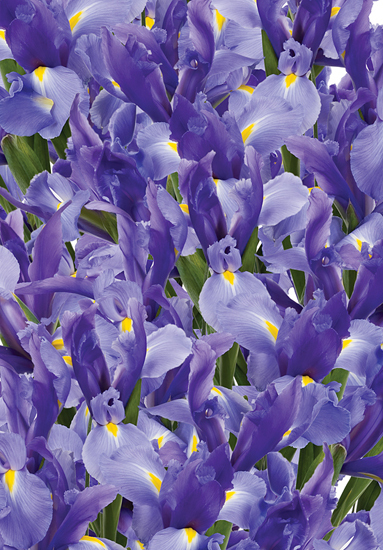 Irises, like tulips, are a Dutch classic, made famous by van Gogh. The beauty of this particular aesthetic is its emphasis on the wild; you don’t need to worry about what is in season or if the bloom is perfect, but rather, placing importance on finding the flowers you love and putting together something unique and steadfastly your own. Many floral schools and designers now offer classes to create inspired and interesting arrangements styled after the Dutch Masters. However, in the spirit of the dreamy and dramatic, we say, why not just go with the flowers you love to create your own sprawling bouquet? 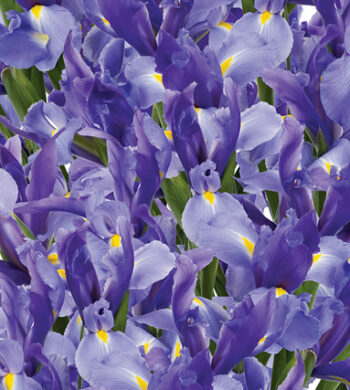 Better yet, get a group of friends together, order some flower favorites, like Irises (an iconic Dutch favorite) and have some floral arranging fun! The beauty of arranging flowers in this style is the informal nature that lends itself well to a gathering where a group can chat and socialize while still making something gorgeous to take home. Not only will you get a bouquet out of it, you will have had an enjoyable experience with people you cherish. While almost anything goes, there are, however, a few elements to follow that bring to life the classic imagery of the Dutch still life. For example, the use of color is a great way to follow this style. Using striking color combinations with blooms in bright and contrasting shades allows you integrate many different types of flowers and add depth and distinction. This is the time to be unafraid to mix and match and see where the colors take you. 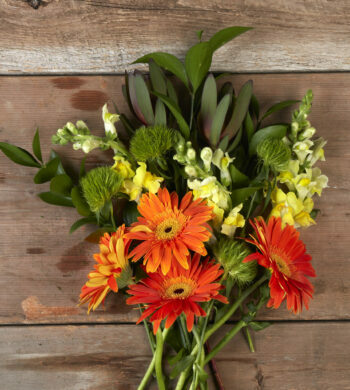 Our Farmer’s Market bouquets are reminiscent of Dutch inspired flowers as they take the day’s best blooms to create a wild and free arrangement. Another element in making a Dutch floral design come to life is in the vessel. Arrange your flowers in low footed urns as the arrangements in the works of art tend to be in lower and smaller vessels, often made of gold, brass, or other metal. The lower position of the vase helps add intrigue as larger vines and blossoms cover parts of it, making the entire arrangement appear mystical and full of movement. 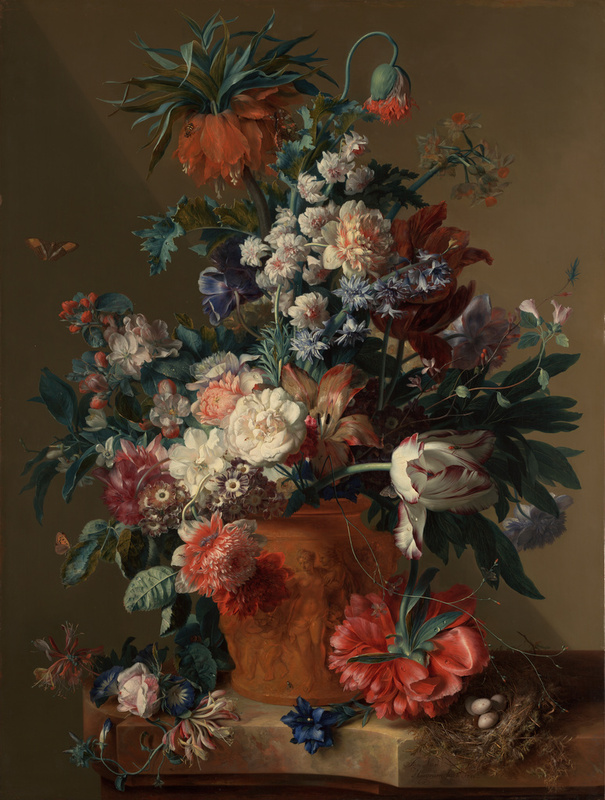 The popularity of the Dutch still life for flower arranging also points to new trends in natural and organic shapes, products, and experiences. A lot of the aesthetic and air also has to do with lighting, again indicating that this is a lived experience. As spring approaches, a walk in nature with friends could bear beautiful, natural items to incorporate into a bouquet. Take inspiration from the day’s best, like you would at a farmer’s market and to make something that honors your memories. Like the paintings that depict butterflies or other small plant-eating animals, bouquets can, too! Additionally, using flowers with blemishes or imperfections simply adds to the individuality of the bouquet. After completing your arrangement, place it on interesting table runners or in a darker area of your home to bring a little light and fresh air into a space. It can serve as a pretty reminder of a wonderful experience as we let nature and history inspire us!